Stemming from the olden days of monogramming with a needle, thread & well calloused thumb, embroidery is the go-to branding method for uniforms. In some respects things haven't changed much - it's still a needle & thread, just moving at much faster speeds. The greatest strength of embroidery is that you’re using the same raw material as the garment (a thread), to brand it. Done well, it integrates seamlessly, looks professional & will remain in good condition for the life of the garment. While embroidery is the most popular branding method, it does have its limitations. Embroidery is achieved by weaving single coloured thread through a garment (rather than sitting atop the fabric like most modern printing methods) meaning there is a limit to the level of detail that can be achieved. Embroidery is the process of creating a logo, text or artwork on fabric using a needle & thread. How is an embroidery created? Up until the start of the machine age, all embroideries were completed by hand using a needle & thread. In the early 1980’s computer controlled machines became commercially viable after Wilcom created software for them. Using this software an image/pattern/artwork is converted into a set of machine data. A garment is placed in a “hoop” which holds the fabric firm. The hoop is mounted into the machine. The machine then uses the data from the software to determine how it moves the hoop whilst the needle & thread are running on the machine. Presto! You've got yourself an embroidery. What can I put an embroidery on? 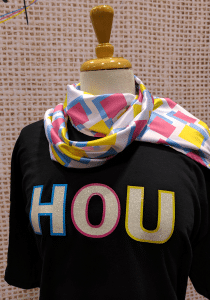 Most fabric or “fabric like” products can be embroidered onto. This includes not just clothing but bags, scarves, banners, towels, sheets, & much more! What are the limitations of embroidery? Limited artwork accuracy/clarity. The clarity & detail that can be achieved with a needle & thread is limited, meaning that complex patterns & images may not be best suited to this technique. You can't reproduce true colour gradients. Whilst blending effects can be created, an embroidery is essentially limited to the 15 solid thread colours on the machine. It's not waterproof. The sewing needle punctures holes in the fabric to allow the thread to pass through. Consequently, if you embroider a waterproof garment, such as a spray jacket, water will eventually seep through the holes created by the embroidery. You can't always place an embroidery where you want to. In order to embroider any garment it needs to be placed in a hoop which holds the fabric firmly in place. Consequently, you're limited to areas on the garment that can be firmly hooped while still allowing sufficient space underneath the hoop for the embroidery machine arm. For this reason, you can't put an embroidery on a pocket without sewing the pocket shut. Not all fabrics can be successfully embroidered. If a fabric is too thin, too stretchy or too thick embroidery can become very challenging very quickly. The size of the embroidery is limited. The size of the hoop that can be fitted to garment as well as the machine sets the limit of the size of the embroidery. Why would I use embroidery? It looks good & is often perceived as the best form of garment embroidery. The perceived class that accompanies a well executed embroidery is unparalleled by any other form of branding, a reputation that most likely heralds from olden times when having your monogram embroidered on your clothes was a reflection of skill or wealth. An embroidery does tend to “sit” better on garments as you're continuing to use the same basic component of the garment - thread - as opposed to introducing a totally new substance. It doesn't deteriorate over time. A good embroidery will usually out last the life of the garment. It's usually the cheapest form of branding for small quantities. Once the initial set up process has been completed there is only a short set up period needed for each job run. It's also easy to alter the colour & sizes of the embroidery for different garments without incurring additional setup fees. What are the artwork requirements for embroidery? Ideally, Vector Formats (EPS, AI, Correl, etc.) or High Resolution Flat Images (JPEG, PNG, etc.) allow for the best results. 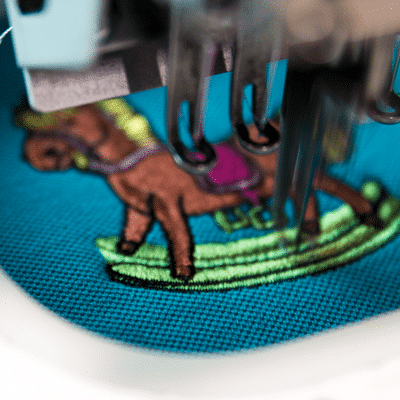 Unlike other forms of branding, when it comes to embroidery we can sometimes get away with lower quality images as the artwork is totally recreated into embroidery machine language. What is the difference between an embroidered badge & a regular embroidery? A regular embroidery is sewn directly onto the garment (hat, bag, etc.). An embroidered badge is a regular embroidery that is sewn onto a combination of separate layers of fabric. It's finished off with a stitched border. This “patch” or “badge” is then sewn on to the garments, usually with a single straight stitch along the border edge. The advantage of this technique is that the badge can be easily removed by unpicking the straight stitch. The ease of removal is also its disadvantage as it is more likely to become damaged than a direct embroidery. Additionally, a badge or patch lacks the permanent & integrated look of a standard embroidery. What is a woven badge? A woven badge is similar to an embroidered badge but the picture/artwork is constructed through weaving instead of embroidering. This results in a smooth, flat finish & allows for more clarity & definition.